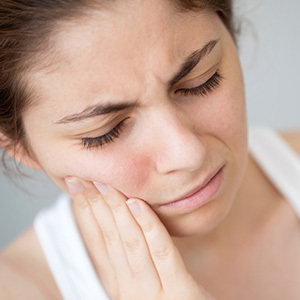 If you have chronic jaw pain, you know how difficult eating, speaking or even smiling can be. Many sufferers will do anything to gain relief, even surgery. But before you go down that road, consider the traditional conservative approach to temporomandibular disorders (TMD) management first—it could provide the most relief with the least risk of side effects. The temporomandibular joints connect the lower jaw to the skull on either side of the head. These ball and socket joints also contain a cushioning disk to facilitate movement. This disk is believed to be the primary focus for jaw pain problems known collectively as TMD. Doctors now believe injury, stress, metabolic issues, jaw anatomy defects or similar factors trigger the chain reaction of muscle spasms, pain and soreness that can erupt during a TMD episode. A TMD patient may experience pain within the jaw muscles or joints themselves, clicking sensations, or an inability to open the jaw to its full range. TMD therapy has traditionally followed an orthopedic path—treating jaw joints like any other joint. In recent years, though, a more aggressive treatment model has emerged that promotes more invasive techniques like orthodontics, dental work or jaw surgery to relieve discomfort. But the track record for this model, especially concerning jaw surgery, remains hazy at best and offers no guarantee of relief. These techniques are also irreversible and have even made symptoms worse in some patients. It’s usually prudent, then, to try conservative treatments first. This can include pain and muscle relaxant medication, jaw exercises, stretching and massage, and dietary changes to reduce chewing force. Patients with teeth grinding habits may also benefit from a bite guard worn at night to reduce the biting force during sleep and help the joints relax. By finding the right mix of treatments, you may be able to find significant relief from TMD symptoms with the conservative approach. If not, you might then discuss more invasive options with your dentist. But even if your dentist recommends such a procedure, you would be wise to seek a second opinion. TMD can definitely interfere with your quality of life and peace of mind. But there are ways to reduce its effects and make for a happier life. Are You Maintaining Proper Dental Hygiene? Energy Drinks and Your Childs Teeth.